In 1787, 55 delegates to the Constitutional Convention gathered in the city of Philadelphia to debate the foundational document for the newly formed United States. Among the delegates were George Washington, John Adams, Benjamin Franklin and James Madison -- men whom history would one day acknowledge as the Founding Fathers. Some had turned away from orthodox Christianity to embrace Unitarianism or Deism, liberal strains of Christianity that stressed reason and free inquiry over revelation. Others adhered to more traditional forms of the religion. Despite individual differences, these men professed a belief in God as the Creator of the universe and believed that religion encouraged a moral citizenry, which they deemed essential to the success of the new republic. Yet they were keenly aware that European history demonstrated the power of religion to spawn sectarian strife and violence. By time of the convention, the Founding Fathers and "ordinary" Americans subscribed to the idea of religious liberty. This was not an abstract principle but a vital, living concept influenced by multiple sources, including Whig political theory that rejected the concentration of political power; the experience of religious dissenters, British and American, who resisted the authority of established churches; and the religious revival known as the Great Awakening that stressed individual experience over orthodoxy. The concept of religious liberty was coupled with a corollary principle: The state must have no power to establish a church or to impose religious conformity. In Philadelphia, the delegates agreed that the federal government should be kept out of religion. Some, like Madison, favored a complete separation of church and state at the federal and the state level. Others wanted to permit the individual states to support established churches if they so chose. Both groups were reluctant to make explicit references to God in the nation's founding document. Religion was only mentioned in Article VI, which forbids any religious test for public office. In spite of this, many states did have religious tests for office. 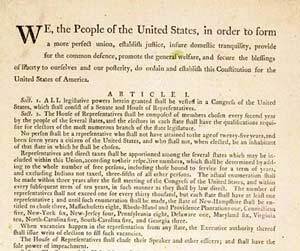 After the draft of the Constitution was approved in Philadelphia, it went to the states for ratification. But ratification was not assured. Many Americans were shocked that the document did not acknowledge the divine Creator. The Baptist minister John Leland was dismayed by the absence of a written guarantee of religious liberty. Thomas Jefferson, then serving as the American envoy in Paris, also believed that a written guarantee of liberty was essential. Madison, architect of the Constitution, thought that such a guarantee was unnecessary. He worried that listing some rights risked omitting others that deserved protection. If rights were not mentioned, he reasoned, then the federal government would have no power to interfere with them. Moreover, Madison was convinced that the sheer variety of Protestant sects would prevent any single denomination from gaining ascendancy over the others. Jefferson encouraged Madison to reconsider his position. Madison was a practical man. He recognized that the absence of a written guarantee imperiled the Constitution's ratification and threatened the viability of the new republic. Madison also wanted to get elected to Congress to ensure that the work of the convention was not undone. In his congressional campaign against James Monroe, Madison promised to support the Bill of Rights; he was elected and kept his promise. With Madison's guidance, the First Congress approved the First Amendment to the Constitution that begins: "Congress shall make no law respecting an establishment of religion or prohibiting the free exercise thereof." The amendment applied only to the federal government, not to the states. Some states, including Massachusetts and Connecticut, continued to use taxpayer money to support established churches. In 1833, Massachusetts became the last state to end such support.